If I ever get exiled to a desert island and can only pick three things to eat for the rest of eternity, I’m screwed. There are just too many delicious, delicious things in the world. And too many delicious variations of those delicious, delicious things. Like bagels! Plain bagels are delicious, obviously. But then there’s POPPYSEED and CINNAMON RAISIN and a million other varieties. Even if I decided to take bagels with me on a desert island exile, that’s only half the battle – I’d still have to choose what KIND of bagel to take (unless all bagels count as one in this game? AHHH, LOOPHOLES). But I think (at least for today) that if I HAD to pick just one bagel to eat forever and ever, it would be this bagel. It’s kind of a game changer. 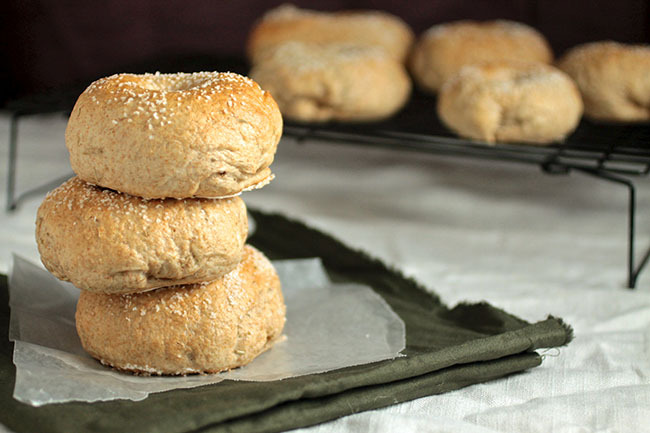 I based the recipe on one of our favorites at Collegetown Bagels – and I can’t stop eating them. I really can’t get enough of the rosemary and salt combination. 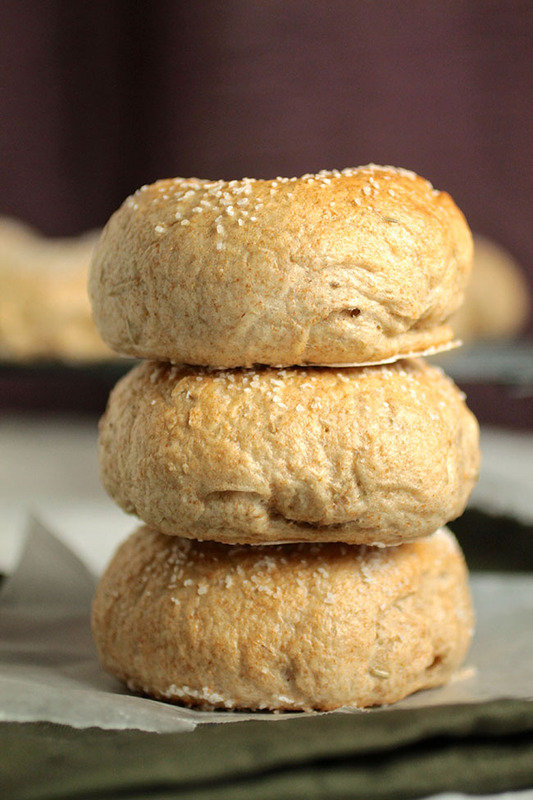 I think these are perfect when they’re toasted with a bit of butter, but I’ve also been using them for sandwiches and slathering them with fun cream cheese flavors. There’s really no wrong way to eat bagels, in my opinion. I generally opt for the stuff-them-all-in-my-face-as-soon-as-they-come-out-of-the-oven route. But to each their own. In the bowl of your stand mixer (or a large bowl) combine yeast, sugar, and warm water. Let sit 5 minutes to proof the yeast. Add olive oil, kosher salt, flours (all-purpose and wheat), and rosemary to bowl. I like to crush the dried rosemary up a bit to let more of its flavor out and break down any large pieces. Using the dough hook of your mixer (or your hands, if you're going mixer-less) knead to incorporate flour until dough pulls away from the sides of the bowl. Dough should be slightly sticky but not wet, and should hold together. If dough is too wet, add a bit more flour. Too dry? Add a tablespoon or so of water. Transfer dough to an oiled bowl (you can totally use the same one you mixed it in if you want, just spray the bowl with cooking spray) and turn to coat the top of the dough with a light layer of oil to prevent sticking. Cover bowl with a tea towel and let rise in a warm place until doubled in size, about 1 hour. When dough has doubled in size, turn it out of the bowl onto a lightly floured cutting board and punch it down. Cut dough into eight (for large bagels) or ten (for smaller bagels) pieces. Roll each piece of dough into a ball and place balls seam-side down on the floured cutting board. Let dough rest for 10-15 minutes. To form bagels, poke a hole in the center of each dough ball with your finger and gently pull to stretch the dough into a bagel shape. When all bagels have been formed, cover with a towel and let rise for an additional 30 minutes. When water is boiling, gently place bagels one at a time into the boiling water with a slotted spoon. This can take a bit of practice, but it gets easier the more you do it! Leave bagels plenty of room to float around - don't overcrowd the pot. I can usually fit 2-3 bagels at a time in my large stock pot. Boil bagels for about 1 minute on each side, using a slotted spoon to gently turn them over in the water once the first side has cooked. 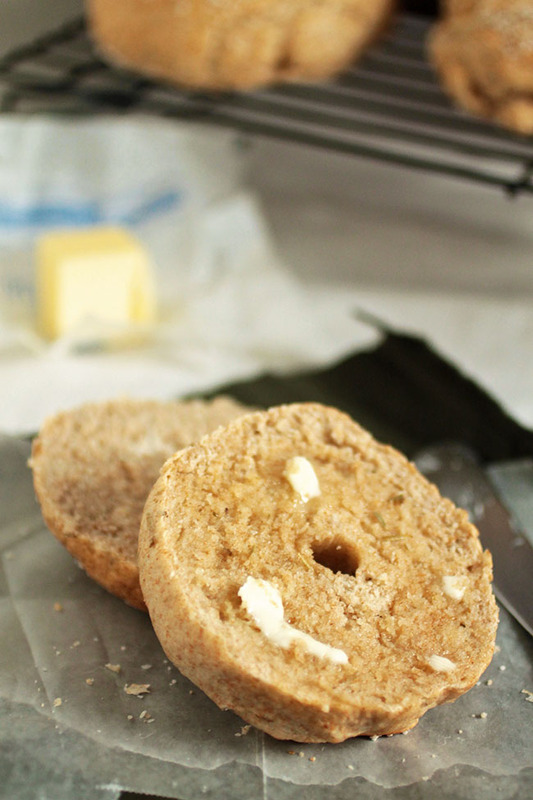 When each side has finished boiling, use a slotted spoon to remove bagels to your baking sheet. Make sure to place them on the baking sheet seam-side down. 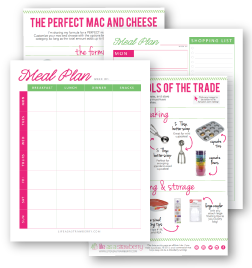 (Depending on the size of your bagels, you may need to use two baking sheets). As soon as bagels are placed on the baking sheet, sprinkle the top with a layer of kosher salt. I use about ⅛ tsp. of salt per bagel. 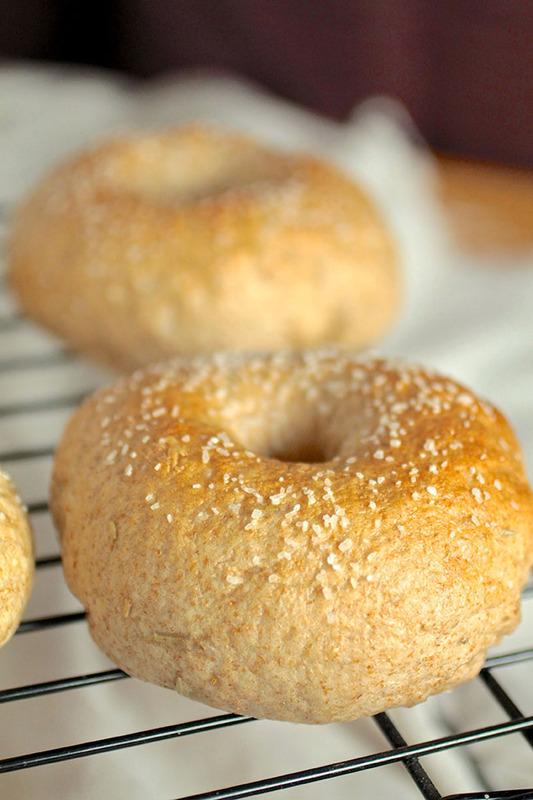 When all bagels are boiled and salted, bake them at 425 degrees for 13-15 minutes, until lightly browned. If your bagels are on the larger side, you may need to extend the cooking time. These are amazing! I’ve made them twice. The first time I followed the recipe exactly as written, and the second time I used only white flour. Both were excellent. Thank you! I just made these and they smell so heavenly! I can’t wait to take a bite of one! I’m so happy to hear it, Michelle! I hope you loved them! After my last visit with my daughter at Cornell, I’ve been craving this bagel flavor from CTB!!! I live in Georgia, so you may have just saved me from despair!! I can’t wait to try this recipe!! These bagels are the best! I hope you like the recipe when you try it! 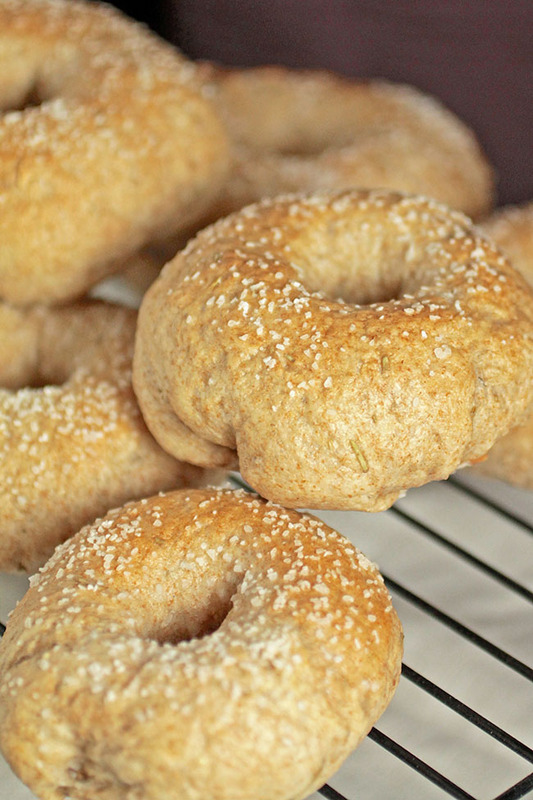 I’ve always wanted to make homemade bagels, but never had. These looks so good Jessie!